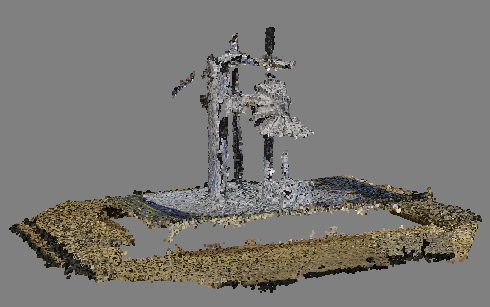 During the last few weeks, we’ve compared two digital photogrammetric software applications by using the same images of the same object to create 3D models in both programs. We’ve analyzed the contrasts in the resulting files. 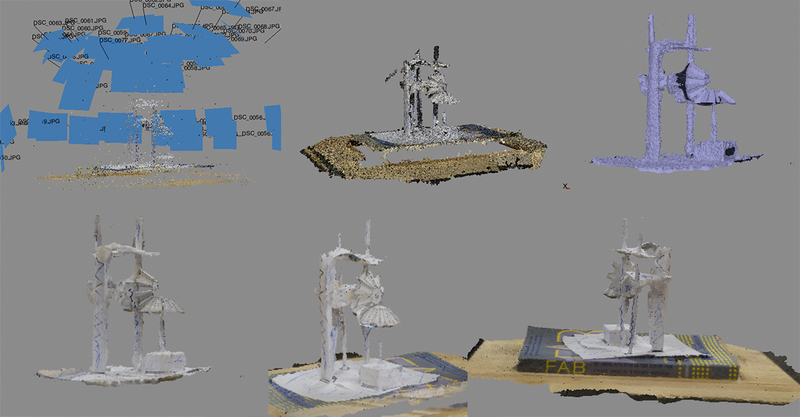 The programs we tested were 123D Catch (a free, cloud-based app) and Agisoft Photoscan (which runs locally). There are two versions of Photoscan: Professional and Standard. For our tests, we used Professional. The main difference we encountered between these two applications was the varying levels of user participation in the model-making. While 123D Catch essentially black-boxes the transduction of images into a 3D model (e.g., it affords absolutely no user choices or interventions during image processing), Photoscan allows you to edit and tweak your model during each part of its four-stage modelling process. 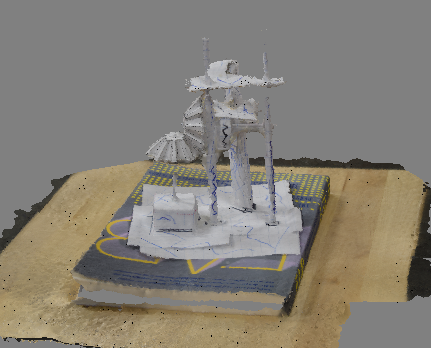 In Photoscan, you are also able to save your progress at any point during the model-making, meaning you don’t have to restart your model if you make a mistake. The first step in this Photoscan process is photo alignment, where you pinpoint areas where you want more or less focus. This pinpointing is useful when the image processing tries to absorb objects in the background of your photographs. 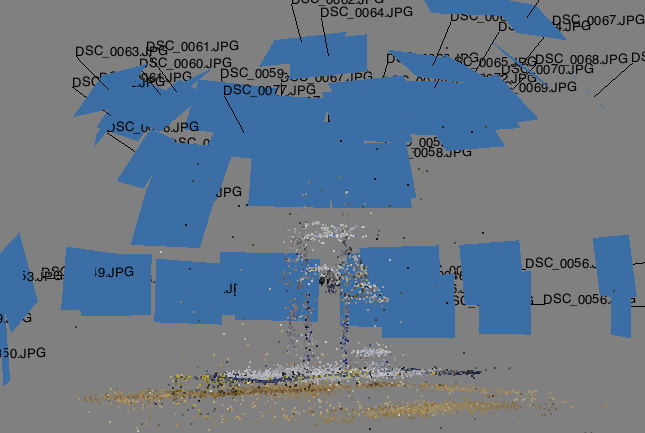 The second step is to build a dense point cloud, where you resize or rotate areas you wish to focus on and also block out certain parts of your image to ensure that only the object will be modelled. Next, a mesh is built, and Photoscan adapts your changes into an accurately shaped model. Finally, you are able to add texture. We think this step accounts for Photoscan’s immense accuracy in replication. This step transforms the model from a printable OBJ into a highly accurate representation of an object that can be studied. 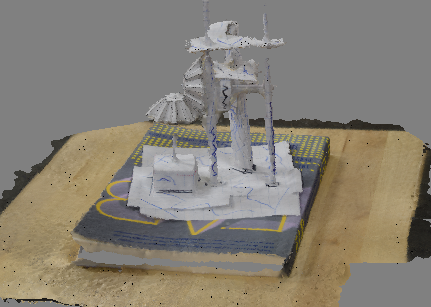 It also creates models where you can measure surface area as well as volume. This feature could afford the production of incredibly granular models of historical artifacts (in terms of size, texture, and form) without the need to acquire or handle the source artifacts. While testing Agisoft Photoscan, we also investigated how it is currently being used to support academic research. For example, the University of Michigan is using it to digitally reproduce the Gabii Project, a major archaeological excavation in central Italy. We also discovered several instances where Photoscan has been used to support Geography or Environmental Science research: the University of Tasmania has been using Photoscan to study sea ice, and the Geological Society of America has been using the program to map out the topography of earthquake-prone areas. Photoscan lends itself particularly to modelling geographic areas because it allows users to include specific coordinates when uploading photos. For humanities researchers, Agisoft Photoscan could provide opportunities to rather easily create detailed models of historical artifacts and geographic areas for archival and analytical purposes. For instance, at Georgia State University students are using it to recreate spaces on campus that have a historical connection to the 1930s blues scene in Atlanta. During the balance of this 2014-15 academic year, we’ll be using it to build and share components of the Kits for Cultural History. Post by Katherine Goertz and Danielle Morgan, attached to the Makerspace and KitsForCulture projects, with the fabrication tag. Images care of Katherine Goertz and Danielle Morgan.